PEN American Center has invited new authors to host tables at its annual gala, after six authors withdrew to protest this year’s Toni and James C. Goodale Freedom of Expression Courage honoring the controversial Charlie Hebdo satirical magazine. Neil Gaiman, Art Spiegelman, Alison Bechdel, George Packer, Azar Mafisi, and Alain Mabanckou will be the six hosts replacing Michael Ondaatje, Francine Prose, Teju Cole, Rachel Kushner, Peter Carey, and Taiye Selasi, who were among 60 other writers who chose not to participate in the May 5 gala. PEN American’s decision to award Charlie Hebdo, the offices of which were attacked in January, has caused controversy in the literary world. The writers who withdrew from the gala stated that, in honoring the French magazine, “PEN is not simply conveying support for freedom of expression, but also valorizing selectively offensive material,” referring to the magazine’s infamous cartoons. I was honored to be invited to host a table. The Charlie Hebdo cartoonists are getting an award for courage: They continued putting out their magazine after the offices were firebombed, and the survivors have continued following the murders. And in a letter to PEN, which she posted on Facebook yesterday, the journalist Christiane Amanpour refutes the “PEN 6”’s claims that Charlie Hebdo’s satirical cartoons specifically targets French Muslims. …a precise examination of their satire shows they are actually targeting the absurdity, violence, misogyny, hatred and intolerance of global Islamic extremism. 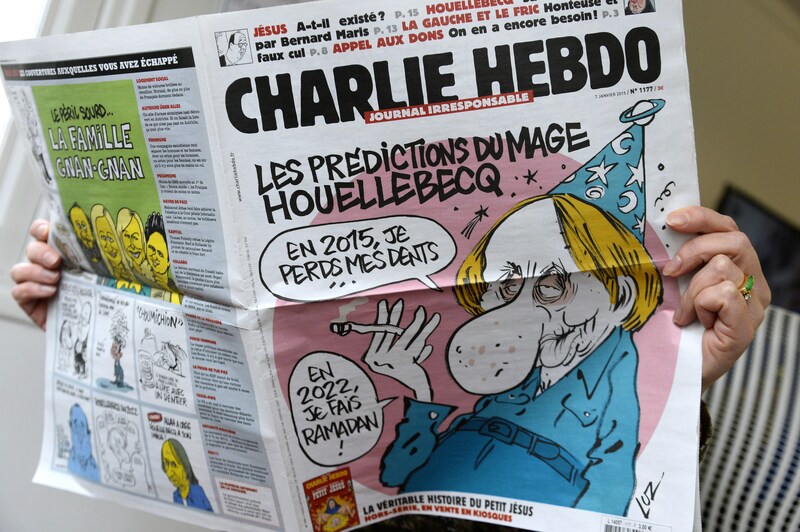 You can like or dislike what Charlie Hebdo does, find it funny or not, but to suggest that somehow they were inciting hatred and violence and ….not so subtle subtext…"oh well, the cartoonists were asking for it then", is categorically wrongheaded, churlish and morally repugnant. Andrew Solomon and Suzanne Nossel, PEN American's president and executive director respectively, wrote an Op-Ed in Friday's New York Times explaining the organization's decision to honor Charlie Hebdo on May 5. "The heated debate," they write, "...demonstrates that in an open society, well-intentioned people with shared values can interpret and weigh principles differently." That's the root of the debate, but it also proves "the relevance of groups devoted to freedom of expression."